Drop Mobility, one of North America’s leading micro-mobility organizations, has officially launched a smart bike share system at UBC, achieving thousands of rides within a few weeks of launch. The micro-mobility company, who has partnered with several campuses and cities across North America, will be deploying up to 2000 bikes across UBC’s Vancouver campus over the next year. Within just a few weeks of launching, Dropbike seems to already be a staple on the UBC campus in Vancouver. 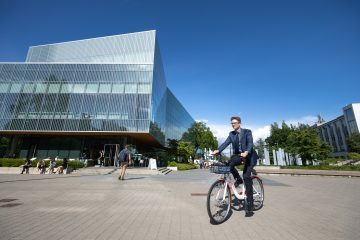 “I’ve seen many students and other community members using the bikes already and I think it’s going to be a great addition to campus life,” says UBC President Santa Ono. Dropbike’s goal is to become one of the most widely used services by students on the UBC campus by developing the most convenient, reliable and inexpensive way to move around. “The main goal of the program is to help UBC students, staff, faculty, and residents get around this large campus a little more easily. We’re hoping the availability of bike share will support UBC’s wellbeing and sustainability goals by encouraging greater levels of activity, reducing barriers to transit use, and making it easier to access the wide range of services and amenities available on campus,” says Adam Hyslop, UBC’s Transportation Planner. Drop Mobility will continue to expand their mobility system at UBC and the lower mainland with the hopes of eventually providing, in partnership, first-and-last-mile solutions to the entire region. Drop Mobility will be hosting a launch party for the UBC community and everybody throughout the Lower Mainland who is interested in attending. Please see this page for event details.